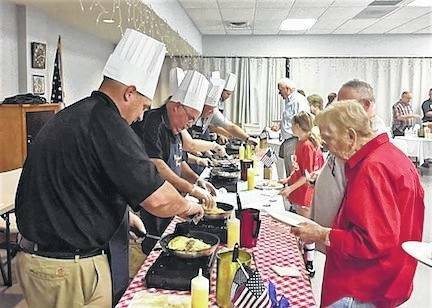 Guests line up to be served at last year’s Celebrity Chef Omelette Breakfast. MOUNT GILEAD — The omelettes and the charity are both fresh. The Williamsport Grange #1815 is sponsoring the Celebrity Chef Omelette Breakfast to benefit the Morrow Little Theatre. “Our donation will help MLT spotlight local talent,” according to organizer and grange member Donna Carver. The breakfast is at Seniors on Center Saturday Sept. 29 from 8 to 10:30 a.m. A freewill donation is accepted. Celebrity Chefs include MLT board members and actors, elected officials, business and community leaders. “MLT is gearing up for the 2019 season. We will be putting on four main shows with the possibility of a few fundraisers and outreach programs as well. The shows include: Diary of Anne Frank (play), Shrek the Musical, Elephant’s Graveyard (play), and Christmas in the Village,” MLT board member Jamie Brucker said. A permanent home is the theater group’s goal. Their traveling lights and sound equipment are outdated. Brucker said MLT is extremely thankful for the Grange’s contributions in making Morrow County a better community to live in. For information call Carver at 419-560-8100 or email: wgrange1815@gmail.com. Each year a different non-profit group is selected by the grange to receive the donation. The Morrow County Sheriff’s Office K-9 program received a check for $4,000 from last year’s fundraiser.